Miabah Uthman of Police, left, collects the 2017 Cricketer of the Year award on behalf of Dane Teelucksingh, from vice-chairman of the North Zonal Council Andrew Hirst. 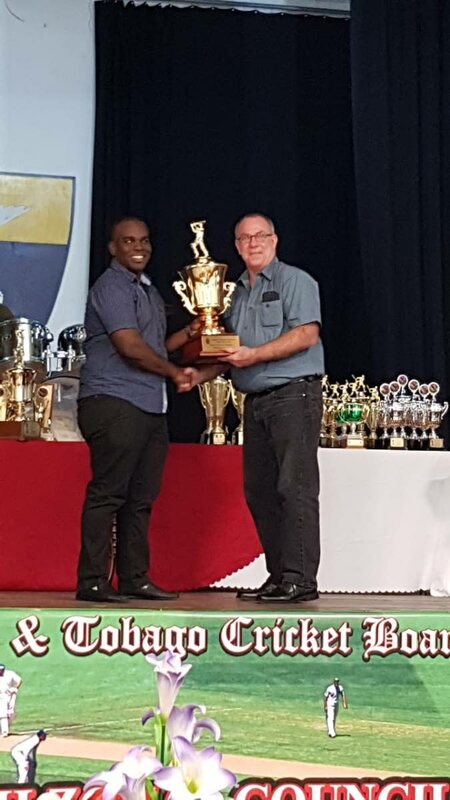 DANE Teelucksingh of Police Sports Club won the Cricketer of the Year 2017, when the 2017/2018 North Zonal Council TT Cricket Board Awards was held at Fatima College, on Saturday night. Teelucksingh was given the nod as 2017 Cricketer of the Year ahead of Joel Seitaram, Kevin Williams, Kenroy Williams and Marlon Phillips. Teelucksingh snatched three five-wicket hauls for the season. He also took 10 wickets in a match on two occasions, grabbing 10 for 53 against Harvard and 12/60 versus Sweet Revenge. Awards were handed out for five-wicket hauls, 10-wicket hauls, century makers and the top teams in the various competitions. Among those who attended the event were chairman of the North Zonal Council Winston Sobers, vice-chairman Andrew Hirst and veteran journalist Tony Fraser, who delivered the feature address. Fraser spoke to the audience about doing their part in changing the current administration of Cricket West Indies. Reply to "Teelucksingh wins North Zonal Cricketer of the Year"